Okay, I'm about a month and a half overdue in posting this recipe, which I made for dessert on St. Patty's Day. Someone told me oatmeal cookies were most appropriate, however, I was in the mood for chocolate. These cookies from King Arthur barely lasted the day. I made them a touch healthier by using white whole wheat flour which made for a slightly hardier cookie. Cream butter and sugars until smooth. Add the eggs and vanilla one at a time, beating well after each. In a separate bowl, whisk together the flour, oats, baking powder, baking soda, and salt. Add to the butter mixture in the bowl and mix until thoroughly incorporated. 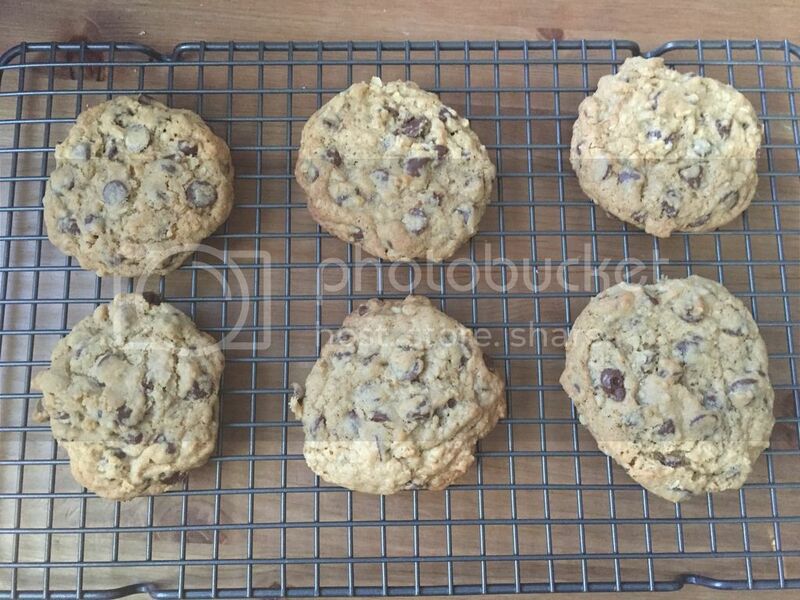 Using a cookie scoop or rounded tablespoon, fill cookie sheets, leaving about 1 1/2" to 2" between cookies. Bake 12 to 15 minutes, until cookies are a light golden brown, with slightly darker edges. Cool on pan for a few minutes before removing to racks.